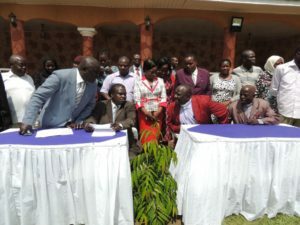 Through the Migori Interfaith Network, the religious leaders said laws are what create order and blamed the current tension in the country on Kenyatta and Odinga defiance against the law. The Chairman of the Network Rev. Cornel Pesa said Kenya had made a big milestone in the region by the promulgation of the Constitution Of Kenya in 2010 but was being dragged to old ways. “As a nation, we have set for ourselves the Constitution of Kenya 2010 and the various laws as enacted through Parliament to be the guiding principles,” Rev. Pesa said. During the chaos that have been going on after the August disputed election, there have been reports of members of the public and the police engaging in acts that go against the law. The religious leaders also called out the continued disregard of the countries unifying values by the leaders that have led to a highly polarized nation in the recent past. They pointed out widespread corruption, division along ethnic and political lines conflict and despair as some of the leading causes of disunity in the country. The Migori Interfaith Network also urged Kenyans to remain calm as the country awaits the ruling from the Supreme Court on the petition challenging the election Uhuru Kenyatta and his deputy William Ruto. The Network noted that many people have lost their lives since August 8 disputed election and any disruption of peace would lead to loss of more lives. Through a statement in Migori town, the leaders said there was need for peace as some victims of the skirmishes that broke out after the August 8 and October 26 are still nursing injuries. “As the clergy we have visited, consoled and prayed with a number of post-election victims at various hospitals and homes,” Rev. Pesa said. They urged leaders to avoid making statements that will fuel chaos but prepare their supporters to accept the outcome of the Supreme Court ruling.